Something good. And about time! 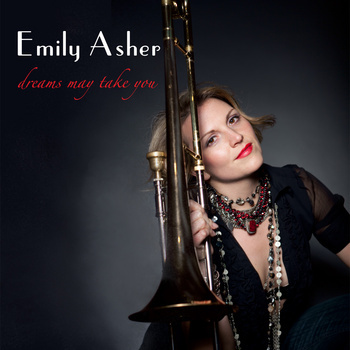 It’s trombonist / singer / composer / arranger / bandleader Emily Asher’s debut CD, sweetly titled DREAMS MAY TAKE YOU. Along with Emily, you will hear Wycliffe Gordon, on sousaphone and trombone; Bria Skonberg, trumpet, vocal; Philip Dizack, trumpet; Dan Levinson, tenor sax, clarinet; William Anderson, alto sax; Nick Russo, guitar, banjo; Gordon Webster, piano; Kelly Friesen, bass; Rob Adkins, bass; Kevin Dorn, drums; Rob Garcia, drums. For those of you familiar with the hot New York scene, those names are a guarantee of fine swinging inventive jazz. Much of the repertoire would appear to be “good old good ones,” including SUNNY SIDE OF THE STREET and SOMEDAY YOU’LL BE SORRY, but the CD is anything but by-the-numbers. Emily is more than a fine trombonist and a sweetly winning singer: she is an imaginative musician, so the CD doesn’t bog down in the same thing; every track is its own vignette. It begins with a romping version of ORY’S CREOLE TROMBONE, which Emily delivers with a fine gutty fervor (and her own version of a trombone cadenza). The soloists share Emily’s high-flying enthusiasm, and the rhythm sections couldn’t be better. So the chestnuts have a delightful 2012 Condonite bounce and looseness. The CD’s title comes from an Asher original — by Emily’s father — called LULLABY FOR A LITTLE ONE, on which Miss Asher sings with winsome charm. (And she knows when to leave an audience wanting more: the LULLABY is a delicious cameo, slightly over two minutes.) It’s followed by a New Orleans “second line” version of CHANGES MADE, which would cause the sedentary to start dancing. The original SWEET PEA is part cowboy-ballad, part rocking barcarolle, with touches of Fifties West Coast cool arranging. HEY, LOOK ME OVER is Emily’s childhood party piece — which begins in an easy waltz-time before morphing into sleek swing — that won me over when I saw her do it (with apt choreography) at Radegast. A streamlined EMPEROR NORTON’S HUNCH has shed all its two-beat trappings, and bursts forth gracefully. SUNNY SIDE OF THE STREET features the duet stylings of Asher and Skonberg — neatly warbling the hip variations I associate with John Birks Gillespie — before the ensemble gives way to a piano / trombone duet. Emily’s original GREAT BIG WALL will be the only song you know (I would guess) that mixes Latin rhythms and Middle Eastern tonalities. Successfully, I must add. YOU ARE MY SUNSHINE begins with a slide guitar / trombone duet and then blossoms, lyrically. MUSKRAT RAMBLE begins with the Hot Five introduction and rocks from the first note (not too slow, not too fast, either) — with a splendidly tapping drum solo by Kevin Dorn in the middle. SOMEDAY YOU’LL BE SORRY, taken at a brisk clip, is another trombone-piano outing, very delicate in its earnestness, with a straight-from-the-shoulder vocal by Emily, taking the lyrics with a gentle seriousness that would have pleased its creator. And the disc ends with LIMEHOUSE BLUES, a version that had the energy of the World’s Greatest Jazz Band of fabled memory. Nothing’s dull or forced on this CD: it’s one of those rare creations where you want to play it over again when it ends. I couldn’t attend Emily’s May 29 CD release party at Radegast — a true Garden Party, I hear — but the CD is its own jubilant party. You can purchase one here — either as a digital download or a physical CD. And the GP will be strolling around the New Jersey Jazz Society’s JAZZFEST on Saturday, June 16, which begins at noon and ends at 9 PM. And when Emily and company need a rest, you can hear Jon Burr, Lynn Stein, Andy Farber’s Swing Mavens featuring Champian Fulton, the Harlem Renaissance Orchestra, the Tony DeSare trio, Eddie Monteiro, Swingadelic, and more. Tickets can be ordered at 908.273.7827 or online at http://www.njjs.org. Look out, world: here she comes! TO HONOR KENNY DAVERN, CLICK HERE: ALL MONEY GOES TO THE MUSICIANS! Don Wolff, our generous benefactor, has offered these performances by Kenny Davern’s favorite quartet from a 2004 New Jersey Jazz Society concert. Half of this quartet — Kenny and his favorite drummer, Tony DiNicola — are gone. Happily, guitarist James Chirillo and bassist Greg Cohen are very much on the scene. These performances mix intensity and lightness, and although I’ve sometimes thought that Davern, at this stage of his career, was more concerned with polishing his craft than taking risks, I realize that such hair-splitting is meaningless when faced with such music and the void Kenny left when he died. The discussion between those who privilege the “art” of improvisation and the “craft” of perfecting your approach to a particular song seems less important than the result. What’s all this? Scott E. Brown wrote a wonderful book about our man James P. Johnson, A Case of Mistaken Identity: The Life and Music of James P. Johnson (Scarecrow Press, 1986). Johnson, as many of you will know, taught Fats Waller, composed “Charleston,” “Runnin’ Wild,” “If I Could Be With You One Hour Tonight,” “Mule Walk,” and many others. To my ears, he is the most satisfying of the great Stride players. But he also wrote longer works, including an opera, DE ORGANIZER, with libretto by Langston Hughes — “Third Stream” works bridging jazz and classical music. His more ambitious compositions received insufficient notice, and he may well have died a disappointed man. Scott is up here in New York for a few days to do research at the New York Public Library, and he is looking for people who saw James P. play. That’s not an impossibility: James P. was at the keyboard in 1950 and perhaps beyond. If you have any information for Scott (a pile of acetates in the kitchen cabinet, perhaps) email him at jpjstride@aol.com, or call him at 443-528-1444 (cell). 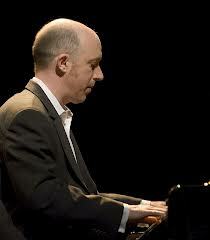 I’ll see Scott on Thursday — we’re going to see Ehud Asherie and Harry Allen at Smalls (!) so I can also pass on messages. Thanks to Tony Mottola, editor of Jersey Jazz, the monthly magazine of the New Jersey Jazz Society, for letting me in on this. Posted in Jazz Titans, Jazz Worth Reading, Pay Attention!